Want To Know What the HOTTEST Gadget is Right Now? An E-interview with Andrew Lunt, Owner, Lunt Solar Systems. With more than 323 million people in the United States and a solar eclipse available for everyone to view – the first thing that is on everyone’s mind: Where do I get the glasses? Well, pro tip: There are only a five NASA and aas.org approved vendors meeting international safety requirements – I recently chatted with Andrew Lunt of Lunt Solar Systems on what the ramp-up to the event has been like. Has this been a sales lifetime high? The eclipse is a “Black Swan” event. It is a learning experience for everyone involved. When we started planning for this two years ago, there was no way to predict the level of interest and/or sales. We were looking at a big unknown. What I did know was that every eclipse event I have attended ends up in chaos in the last week. Estimates of eclipse glasses requirements have been historically short sighted. The nature of the event does not allow for strategic planning of what will sell and when. Given my experience, Lunt decided to invest heavily in glasses and our small telescopes. And while we have had okay sales of the telescopes, our glasses business is just starting to expand very quickly. At the moment my entire business does as much in one day as it used to do in two weeks; and this is only expanding. My company is small. We have been in the Solar telescope and filter business for about 10 years. I have been in the business for 20 plus years and helped pioneer the first retail available Hydrogen-alpha telescope at a price point within range of most astronomy enthusiast. Being small we were faced with the enormous task of trying to figure out how to fulfill the demand. We were in a position to be able to make millions of glasses, but I did not have the personnel to ship even a fraction of that demand from Lunt. The road led to Amazon. What most people do not realize, is at first, Amazon restricts the amount of inventory that you can have in their warehouse for FBA (Fulfilled by Amazon). We needed FBA; and we needed A LOT of FBA. Fortunately for us, Amazon recognized the enormous growth in sales that would come very close to the event (right about now). They adjusted our inventory allowance to a level that allowed Lunt to manufacture the product and know we were partnered with a company that could ensure delivery. The important thing is to make sure we have the product available. People will need these glasses. There is talk that you only need glasses if you plan on being “at” the eclipse. While people in the line of totality will probably want glasses to view the event, they can actually remove their glasses during totality. For everyone else in the USA, they will need glasses to view ALL phases of the eclipse. Glasses are inexpensive and the event is well worth the investment. So, to answer your questions. Yes, this is a major event for Lunt and we have been planning it for two years. We hope to sell everything we made. So far, so good. There is a lot of coverage on fake, knock-off solar glasses – Why is it important to go to a trusted brand? This has been a very hot topic. It is important to look to trusted brands simply because of the amount of counterfeit products that have hit the market recently. AAS.org worked very hard to provide a list of vendors that they have vetted. The original recommendation was to look for the ISO logo on the glasses. Unfortunately, this logo related to hundreds of certifications and really does not provide the customer with the information they need. The logo is also being reproduced on counterfeit product that do NOT meet the requirements. The customer needs to look to reliable sellers to be assured of a quality product that meets the ISO 12312-2 (2015) requirements. They also need to look for traceability of the manufacturer on the glasses. And lastly, they need to contact the supplier if they have any questions BEFORE they buy. Both NASA and aas.org have provided information on how to safely purchase eclipse glasses. What is your hope for capturing imagery capture of the event? The eclipse Megacast is a tier 1 event for NASA. Lunt have partnered with NASA Edge and are tasked with using several Lunt telescopes and some very high tech camera and computer equipment to capture and broadcast 3 live feeds in Hydrogen-alpha, Ca-K, and White light. The entire 4+ hours of the eclipse will be captured to the Lunt SUNlab, processed in real time and broadcast across all TV networks and the Internet. The raw data will be stored and later processed and will probably be re-released in higher resolution. 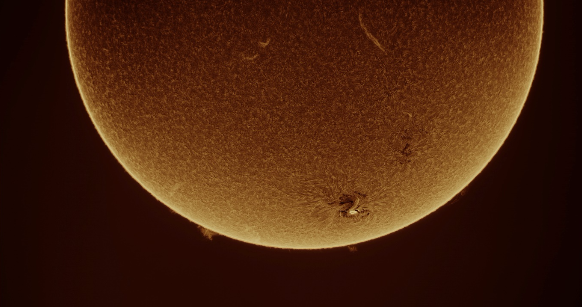 The SUNlab is a state of the art mobile facility that will produce some of the best images of the Sun taken by anyone to date. Is this the most excited your company has been for an eclipse? Excited and nervous. We have a lot going on. Between the processing of eclipse glasses to the huge volume of calls we now take, to the partnership with NASA for the live streaming of the eclipse using the Lunt SUNlab. There’s a lot going on and everyone is very busy. On the on hand it is good to know that our two years of hard work and planning is working out nicely. But we are still pre-event. There’s still work to be done. I am excited, very excited. What’s the next big event people can look forward to after the eclipse? To be honest, we are not looking past the eclipse at this point. There is a great deal of science being done around this event and across the entire country and we are so happy to be a part of it. I am looking forward to seeing the results. I am sure that the images we will be taking will convince astronomers to utilize our SUNlab for imagery in the future. We have been approached by a major movie production company that wants to use the lab to capture close-ups of the sun’s sunspots, active regions and solar eruptions for use in future movies. Anything else you would like to share on the brand and company in general? It’s important that people know that astronomy can be done during the day. A time when kids are in school and can be educated about our nearest star and actually get the opportunity to go outside and look for themselves. If the sun is out it is generally warm and you don’t have to worry about light pollution. It allows everyone to get hands on with a telescope and actually watch something that changes every few minutes. The Sun is never static, and can be quite violent. There is nothing more enthralling than looking through a solar telescope at a Solar Mass Ejection in real time. There is a great deal we can learn by studying the sun; from light, to heat, to plant growth, to fusion, etc. The Sun is a learning tool at all ages. Cause and effect. You get to see it happen, and feel the effect. Hopefully the eclipse will open a new world of wonder to those who experience the event. You can follow Katie Linendoll on Facebook, Twitter and Instagram. Below are some of the amazing photographs provided by Andrew Lunt of Lunt Solar Systems. 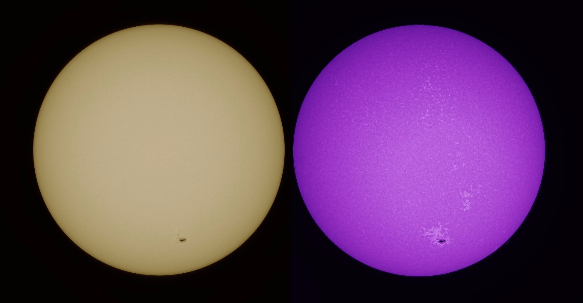 On the left is the white light view of the sun, this is a heavily filtered view of the solar surface. This view is made up of the many wavelengths across the electromagnetic spectrum although this image shows only the radiation in the visible part of the spectrum. 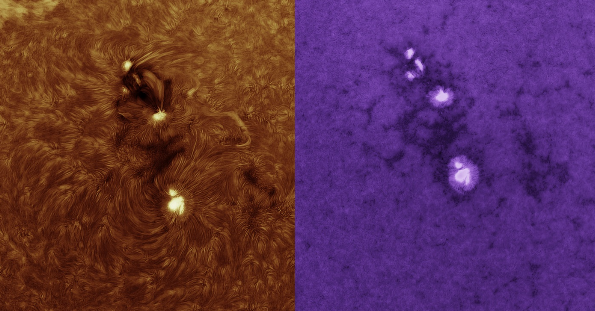 On the right is a view of the lowest level of the solar atmosphere…called the chromosphere. This view is not illuminated by sunlight in the normal sense, rather this is the deep violet light emitted by calcium in the chromosphere. This third view is also of the chromosphere but the light creating this image is emitted by hydrogen. This particular emission line is called Hydrogen-Alpha. The elements in the chromosphere are extremely sensitive to magnetic fields so they will form patterns that reveal the magnetic flux lines extending out from the sunspots and active areas. 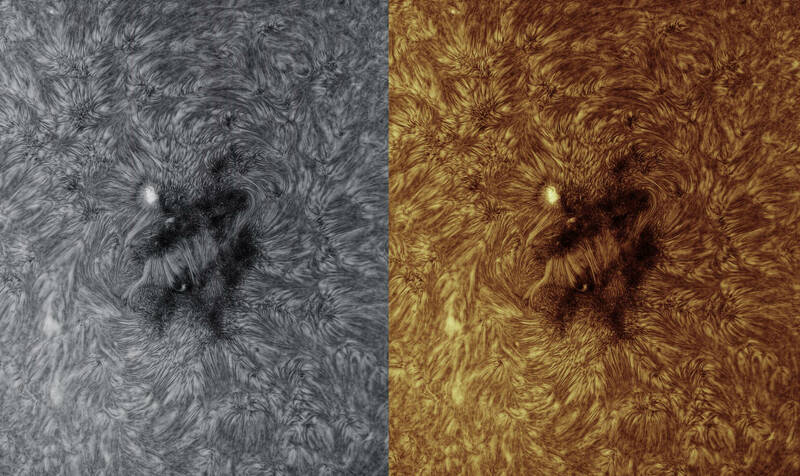 Here are two close up images of the same sunspot group; on the left Hydrogen-alpha and on the right Calcium K-Line II. Helio-physicists rely on the unique views of different atomic emission lines to reveal the complex magnetic activity at play in the sun. Ha close-up of sunspot group. The partially ionized hydrogen forms arches and spiky tubes revealing the exact shape of the normally invisible magnetic fields. These images are created by suppressing all sunlight from the photosphere (surface) while allowing only the dim light emitted by hydrogen in this case (or calcium or any of the present elements) The hydrogen emits light as it moves to a lower quantum state. The energy lost as the electron moves from the third to the second orbital is in the form of light at the exact wavelength; 656.28nm. The calcium K-Line is centered at 393.4nm. 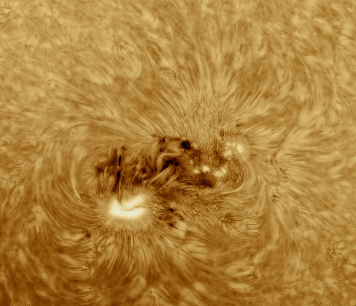 Ha close-up of magnetically active region. The partially ionized hydrogen being extremely sensitive to magnetic fields, conforms to the magnetic flux lines like iron filings or ferro fluid being shaped by a magnet. Why is the shadow of the moon traveling from west to east during the eclipse? Every night I see the moon rise in the east and set in the west. What is the science behind that?